So, I’ve discovered Kim Hargreaves. I now own two of her pattern books and will probably buy her Spring collection which I hear will be published this month. I love her patterns — very polished, easy to follow, love the styling. 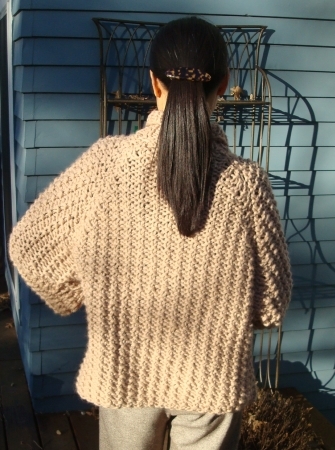 The first one I tried was Nan, which is knit using Rowan Big Wool and on 17’s (I had to order these from the Denise site because my kit only goes up to 15. 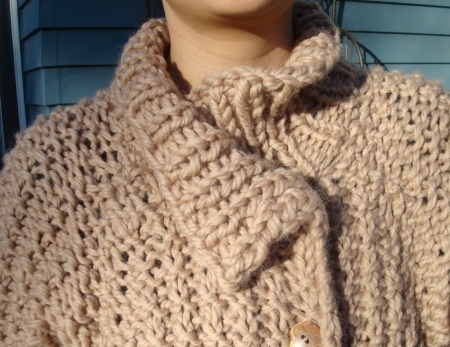 Having finished it, though, I kinda wish I had knit it on 15’s ’cause it’s a bit too big). 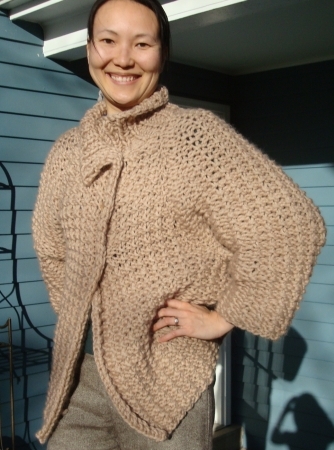 This was a great pattern — easy, fun, quick, and resulted in a great piece of clothing. Like I said, it came out a smidge big, probably 10% big all around and I actually ran out of yarn and had to short-change the collar a bit. 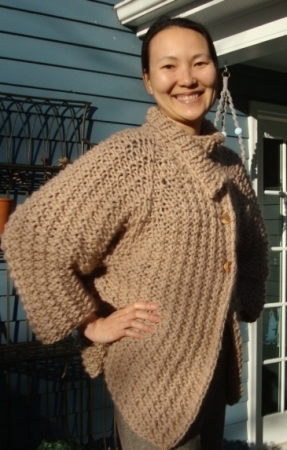 I seriously considered frogging and re-knitting, since it is such a fast knit, especially when I first sewed the buttons on and the collar gaped around my neck. But I re-sewed them in a slightly different place and wear the collar this way, which has the bonus of keeping my neck warm.